Big house, big year, but no vintage port! Conversations elsewhere have prompted this curiosity piece. Which big houses, in general-declaration years, didn’t declare? For these purposes let’s say that valid years are 2003, 2000, 1997, ’94, ’91 or ’92 split special case, ’85, ’83, ’80, ’77, ’70, ’66, ’63, ’60 (? ), ’55, ’45, ’35, ’27 (not ’31). For some retentive reason I think that such a list might be worth learning. Based on information found in the works of Suckling, Broadbent and Mayson I have complied the following list, which is certainly incomplete. 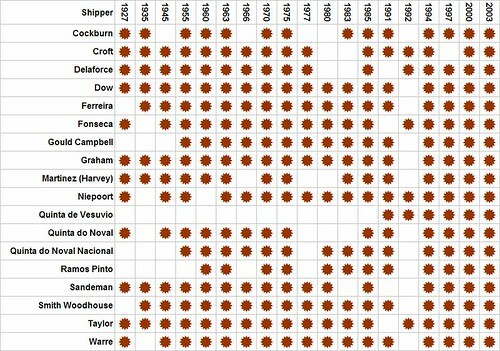 A pattern seems to have emerged in that the vast majority of shippers seem to move as a pack, whilst the former owners of Cockburn, Martinez and Noval were either poor decision makers or had the largest cahoonas in the Douro and were brave enough to resist decalring bad wines. Last edited by DRT on 13:54 Sat 22 Mar 2008, edited 1 time in total. [url=http://www.theportforum.com/viewtopic.php?p=8134#8134]Here[/url] uncle tom wrote: 30 years ago, Cockburn took a sabbatical from VP production, passing on both '77 and '80, because at the time, they were focused on volume products, and wanted to raise the image of their Special Reserve. I don’t know who is wrong, but it’s at least one of you. Unless they did a ‘Special Quinta’ type family bottling. Derek T.: good work, thank you. I should memorise. coulda sworn I've drunk an 83 regular noval in my past life. May have been a single quinta? The 77 Cockburn was produced but not released, I think, and was kept for family consumption. A reference in Broadbent's book suggests that tension between the Directors of Cockburn/Martinez and their "overlords in England" may have been responsible for what the company now admits was an error of judgement. I have added a link to this thread in the Information About Port Sticky at the top of the Forum for future reference. I have finally aquirred both and when the time is right I will open both side by side to compare them with each other. Knowing that Jdaw would not be counting SQVP's, apart from those normally perceived as being "real" VP, such as QdN, QdNN and QdV (from 1989 onwards) I did not include wines such as Silval and Marco in the analysis. Are you sure it was Quinta do Silval and not just Silval? I know that debate has been had many times but I can't recall whether or not we arrived a a definative answer about the use of the brand v the status and ownership of the Quinta. This could perhaps do with a separate thread? Or save them for a visit to New York. Others would be very interested in that comparison. I'm doing some much needed yard work, but I'll post some pics later. The bottle says "Quinta do Silval" on it, along with Quinta do NOval. Not sure if I'll make NY...but i am still looking into it. Thanks for your list, Derek. Do not commit to memory yet! I am finding more whilst doing the research on declarations and will update the above list as I find them. The missing Croft 83 was added today. We need a definition of "Big House". Do we want all of these in the above list of missing VP's or do we want to agree on a subset that fall into the subjective category of "Big House"? 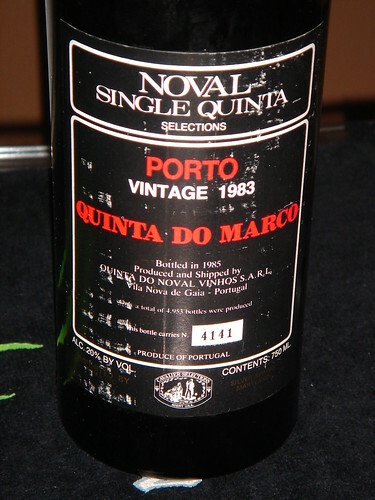 I can't find a pic of the Silval, but it says "Quinta do Silval" in red, instead of Q.do Marco as this one does. Derek T. wrote: We need a definition of "Big House". Perhaps doing this resolves the dilema? but not the others. And some of these could be omitted. This has been produced from the data collected over the past few days, which has not been verified by anyone else so may not be complete and/or accurate at this stage. The selection of Big Shippers is my own and can be changed easily on request. The choice of Big Years was Jdaws and, again can be changed if required. But you have reversed the usual horizontal and vertical directions. I think it looks great is destined to become one of the historic charts in the folklore of port, ranking alongside Baron Forrester's maps. Well, perhaps I exaggerate a little - but I do love it really. I wonder how much it would cost to get printed in glossy ink when it's ready. I haven't seen another vintage chart in this format so am left wondering about the use of the word usual in that sentence. jAHB wrote: I think it looks great is destined to become one of the historic charts in the folklore of port, ranking alongside Baron Forrester's maps. Ahh, but can you click on one of the dots on the Barrn's map and be taken directly to a Tasting Note? AHB wrote: Well, perhaps I exaggerate a little - but I do love it really. I wonder how much it would cost to get printed in glossy ink when it's ready. I agree that this looks absolutely fab, though I also support the suggestion that years go down and shippers across. One other request. Rather than having sunshines, could we have empty circles (or another symbol of your choice)? I'm sure Julian is already considering what additional information can be imparted in the extra degree of freedom that the choice of symbol presents. Anyway, with empty symbols, once up and running, we can colour 'em in as we drink 'em. Soon after we've started that, it becomes a game of VP Bingo. Minor prizes for collecting a whole year or shipper, and the big one for tasting the lot!! Jdaw is in charge of output, I am just the data man. Good suggestion on the empty circles. Wingdings have an empty sunshine symbol that will allow us to achieve more than each of our original suggestions have individually. This is teamwork at its very best. Perhaps what could be denoted within the empty sunshine is a number representing the number of TPF TN's that exist for each wine? This would really only work for an online click-able version.